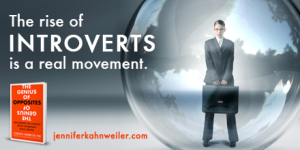 The reporter Sulagna Misra wanted some actionable steps I could share when introverts are faced with meetings, social gatherings and during workplace conflicts. What is an introvert to do? Read more here. I hope you find it helpful. This entry was posted in Uncategorized on August 8, 2015 by Jennifer Kahnweiler. I have had the honor of working with Dr. Jennifer B. Kahnweiler a few times through different events she has helped run or facilitate. I find her to be a fantastic speaker who is full of positive energy and truly knows how to engage her audience. Her material is well thought out and organized for the audience to absorb and understand.